As some SDRs aren't perfectly accurate in terms of being on frequency, there can be a need for a static correction. SdrDx can correct errors to an accuracy equal to the SDR's internal tuning step, which is generally within 1 Hz. Some inexpensive SDRs only allow correction to within 1 KHz, such as the RTL-SDR. Step 1: CENTER tune (center and demodulator frequencies identical) to a highly accurate signal source of a frequency higher than one MHz, such as a WWV or CHU broadcast. The higher the frequency, the better. So 15 MHz is better than 10 MHz; 10 MHz is better than 5 MHz, etc. Step 2: →Right-click Run, which will open the frequency correction dialog, and then →Left-click OK to close it. This clears out any existing frequency correction so that the SDR's actual tuning error may be correctly measured. Step 3: Set the Aux Scope to CAR mode. Step 4: Ensure that the CAR Shift knob is set to its 12 o'clock setting, with the dot at the top of the knob. Then adjust the CAR Span knob so you can measure the frequency error. The CAR Span setting will vary depending on how far off the SDR is. Step 5: →Right-click Run to re-open the frequency correction dialog. Note that the finer the resolution you set the CAR Span knob to, the longer the Aux Scope will take to measure the signal. Step 7: In the correction dialog's right-hand box, change the frequency so that it is the same as the frequency the placed Aux Scope marker indicates. For instance, if you've tuned to WWV at 15000000, but the Aux Scope marker shows that the signal is actually appearing on 15000036.571, you would change the right-hand value to 15000036.571 . Step 8: Press Test . Observe the Aux Scope, waiting for the new measurement if required, and check that the carrier is now properly centered. If it is, you're done, and you can →Left-click OK . If it isn't, continue to adjust the value and press Test as required to get it centered. 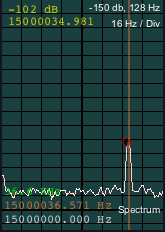 Tip: The →Right-click Run frequency correction is saved for you and restored each time SdrDx starts. The value is unique to each SDR type that SdrDx knows about — so if you switch to a different network SDR, SdrDx uses a value unique to that SDR.